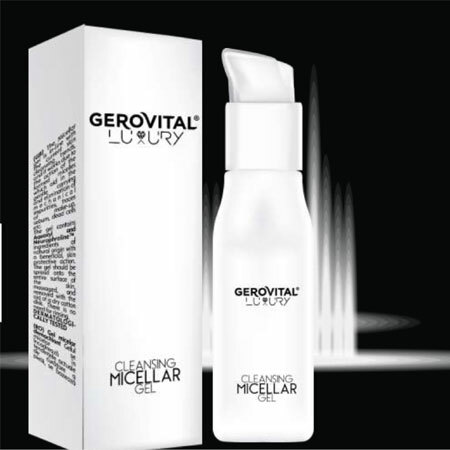 The Gerovital Luxury Cleansing Micellar Gel had been designed as a convenient all-in-one solution that gently removes makeup, pollutants sebum, dead cells and other impurities, leaving skin clean, toned and hydrated. Perfect for all skin types, the micellar gel is enriched with powerful hydrating and skin-protective ingredients that leaves skin soft, refreshed, completely clean, but never irritated. Neurophroline™ is biological skin stress inhibitor proved to visibly improve skin tone in only two weeks. INGREDIENTS: AQUA, GLYCERIN, PEG-6 CAPRYLIC / CAPRIC GLYCERIDES, PPG-26-BUTETH-26, PEG-40 HYDROGENATED CASTOR OIL, XYLITYLGLUCOSIDE, ANHYDROXYLITOL, XYLITOL, ACRYLATES / C10-30 ALKYL ACRYLATE CROSSPOLYMER, TRIETHANOLAMINE, PROPANEDIOL.